Off Maui’s coast, Molokini is a tiny sunken volcano island with what must be some of Hawaii’s best diving and snorkeling. The best spots are in the channel and in the caved in section of the volcano which creates a protected area for marine life. No fishing except by birds who have a sanctuary on the island as well and you can only get here by boat which conserves the coral health as well as the fish numbers and means the water is some of the clearest you will come across - visibility is up to 200 feet. 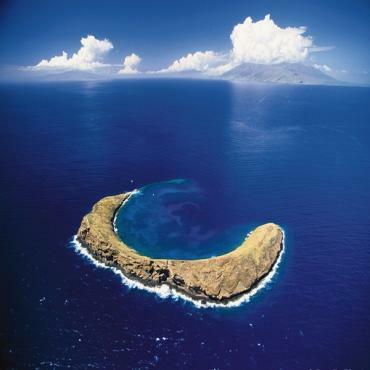 The arc of the volcano rim stops the ocean crashing in. Best snorkeling is around the shoreline which is where the best feeding is. You'll encounter jacks, eels, snapper, goatfish, emperor fish, wrasse, tang, butterfly fish, parrot fish, scad, hawk fish and manta rays, humpbacks and seals. Trips operate daily from historic Lahaina.